The Fairest Run of All: In Which The Seven Dwarfs Wear Shoulder Pads Or Something? In Which The Seven Dwarfs Wear Shoulder Pads Or Something? I come to you today with another Disney Dandy discovery. Sort of. I might not wear this one. It is... different. Anyway, she had a lot of stuff. She mostly liked Judy Garland and The Wizard of Oz by extension, Shirley Temple, and dolls, but she had some Disney things too. Among the Disney items I was bequeathed was a t-shirt. And oh, what a t-shirt it is! 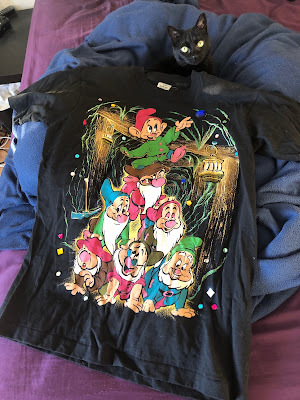 Based on the tag inside, I'm going to guess this shirt was obtained from the Disney Store in the '90s. The tag also denotes this item as a size L; if you ask me it looks more like an XL at least. Although based on vague memories of outfit descriptions in Babysitters Club books, I want to say oversized t-shirts were in at the time? I have never been truly cool a day in my life so someone else who is old+ please confirm. In addition to a snazzy print of the Seven Dwarfs engaging in a little competitive cheerleading, the shirt emphasizes the gem mine setting by adorning the shirt with bedazzled gems. Fozzie says: it's threeeeeeeeeeeeeee-D! All right, so, we're not exactly looking at a tres chic item here. But wait, there's more! 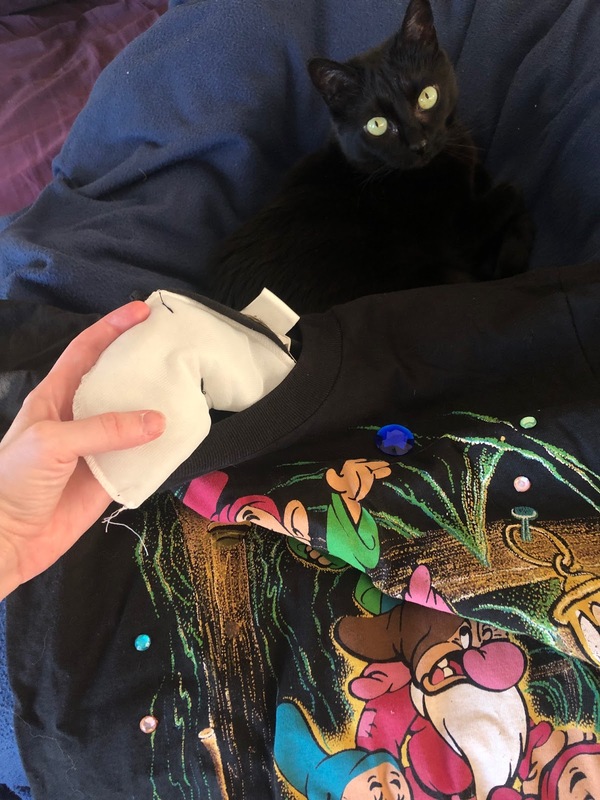 Peek inside the sleeves and what do we find? Why, it's... SHOULDER PADS!!! I know shoulder pads were a big thing in the '80s that probably bled into the '90s at least a bit, but in a t-shirt? I thought it was just, like, blazers and suit coats and crud like that. Shoulder pads in a t-shirt? How? Why? So I don't know what to do with this one. I certainly can't imagine wearing it, but it's so charmingly bizarre I can't imagine getting rid of it either. I think I'll look at it once in a while and giggle to myself.